Here at Drainage Superstore we have a range of decorative lead motifs for you to choose from, designed to add a bit of flair to your lead sheet installation. 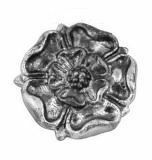 Choose from a range of different styles, including a rose, a classic fleur de lys, or a lion head, and each of the lead motifs is supplied with a durable brass screw for quick and easy fixing onto the lead sheeting. Whichever decorative lead motifs you choose, we are confident that they will create the perfect finishing touch to your leadwork. If you have any questions or queries about lead motifs or your latest project, just give our team a call on 01752 692221 and we'll be happy to help.